2) Whose 35% is 280? Let the required value is x. Let the missing value is x. 4) If 40% of an amount is 250, what will be 60% of that amount? 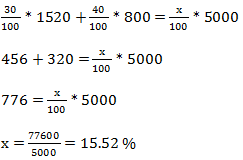 5) If 30 % of 1520 + 40 % of 800 = x % of 5000, find the value of x.